SEOUL, Sept. 19 (Yonhap) — South Korean boy band BTS hit number one on iTunes albums’ charts in 73 countries around the world with its latest record “Love Yourself: Her” on Tuesday, its management agency said. 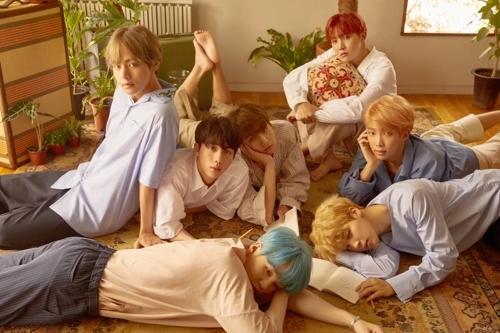 According to Big Hit Entertainment, the new EP album topped iTunes album charts in 73 countries, including the United States, Britain, Australia, Austria, Belgium, Canada and Japan as of 8 a.m., about 14 hours after its release. The number is the largest for a South Korean act. The title track “DNA” landed at No. 1 in iTunes’ top songs charts for 29 countries such as Norway, Sweden, Hungary, Brazil, Chile and Thailand. Preorders for the new BTS album reached 1.21 million copies on Monday, nearly doubling from the some 700,000 for the band’s last album “You Never Walk Alone” released in February. The actual figure is expected to be higher when factoring in overseas orders. BTS, also known as Bangtan Boys, is scheduled to hold the first performance of the new songs during a Mnet show to be broadcast live worldwide on Thursday.